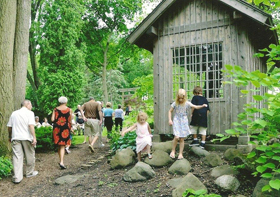 The mission of Preservation Partners is to offer heritage education and to promote the appreciation and preservation of the Fox Valley’s rich architectural and historical resources. Preservation Partners operates three house museums and one school museum in central Kane County, filled with a multitude of treasures and special exhibits awaiting discovery. In addition to site tours at these museums and the Fabyan Japanese Garden, we offer many opportunities to protect our shared heritage, through programs and tours focusing on historic preservation and grass-roots advocacy. We're all familiar with and love our public parks, but there's more history to them than we might know. Come learn with us! Some of the activities include pioneer games (bucket racing), cooking johnnycakes in a spider pan, chores on the farm and more. Historic preservation starts with education. We offer five sites in the Fox Valley to tour & learn, for all ages. Become a member, volunteer, and support us through donation or advocacy. Ready to take action? You can become a contributor to our cause, or participate yourself. Stay informed with our quarterly newsletter, found here on our website or delivered to you.